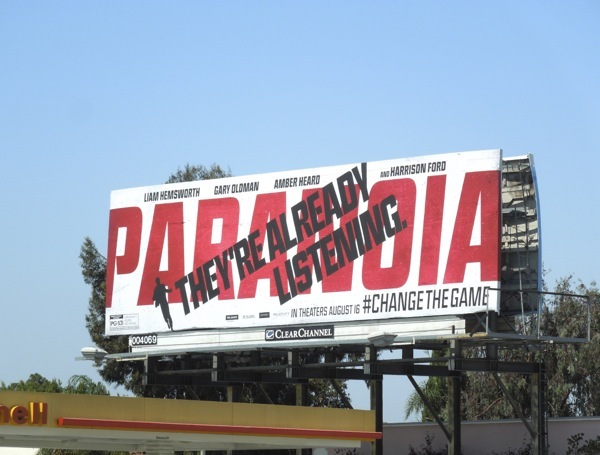 Do you constantly look over your shoulder, believe in every little conspiracy, or feel like big brother is keeping tabs on you (although due to recent revelations, it turns out the U.S. government actually is), well sounds like Paranoia is just the film for you. 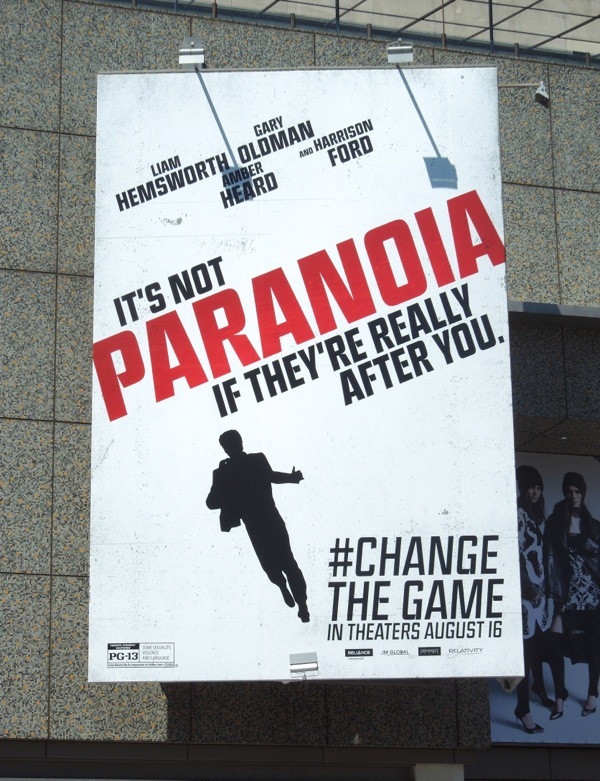 In this latest thriller based on the 2004 novel of the same name by Joseph Finder, a low-level employee at a technology company (Liam Hemsworth) finds himself embroiled in a battle between two powerful high-tech business tycoons (Gary Oldman and Harrison Ford) when he gets caught in their life-and-death game of corporate espionage. When he find himself in way too deep he realises he has to change the game, as the players know far too much to let him simply walk away. 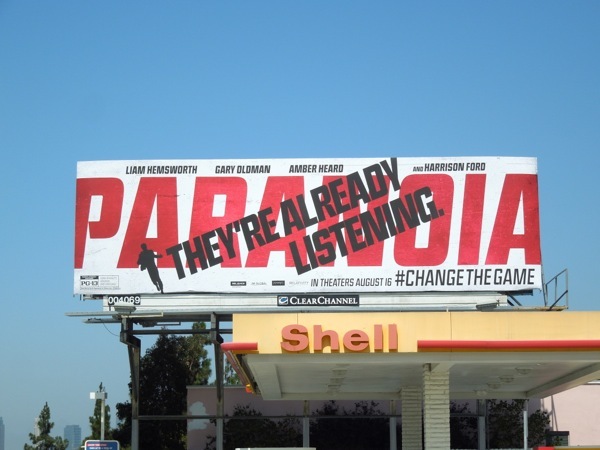 These simple and clever billboards for the movie certainly catch your eye with their paranoid slogans overlaid over the film's title, plus the little running man silhouette also helps evoke the thriller genre. 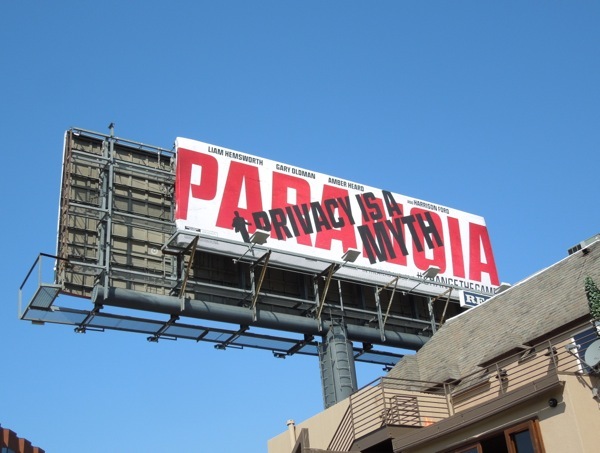 The 'Privacy is a Myth' creative was spied along both Sunset Boulevard in West Hollywood and Ventura Boulevard in Studio City on July 23, whilst the 'They're already listening' version was spotted at the busy intersection of West Olympic Boulevard and San Vicente Boulevard on July 26, 2013. 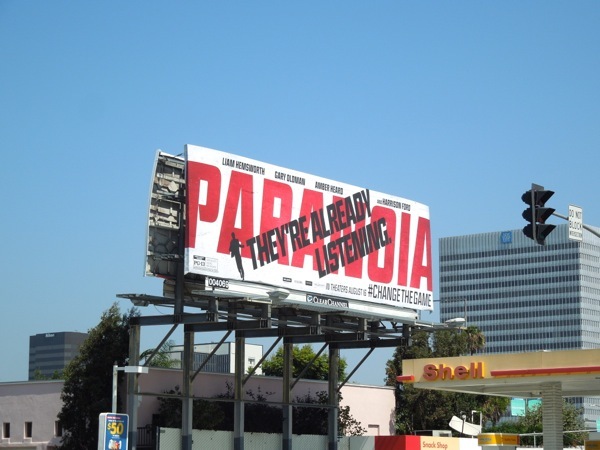 Paranoia sounds like it's an intriguing movie, but don't trust Daily Billboard's word, go see it for yourself. 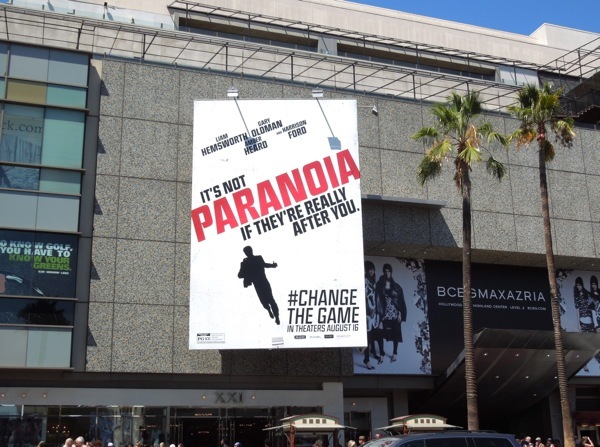 UPDATED: Here's another different creative, this time portrait format, which really sums up the plot of the movie 'It's not paranoia if they're really after you'. 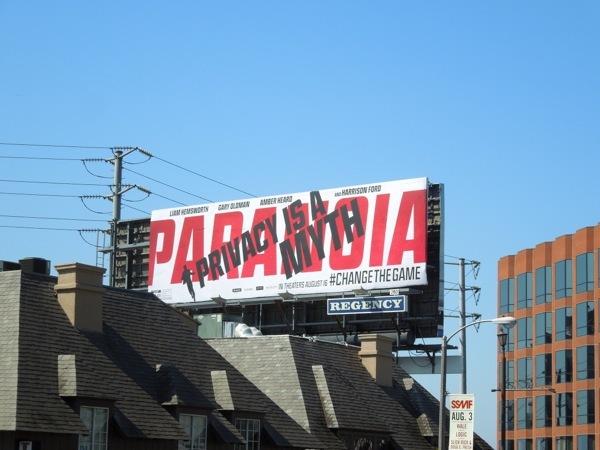 This eye-catching billboard was spied along the busy Hollywood Boulevard tourist destination at Hollywood & Highland on August 8, 2013.